We were staying in Pickwick Landing, TN this past weekend, which happens to be an easy drive away from the famous Shiloh battlefield. In April 1862, Union and Confederate forces fought a fierce two-day battle near Shiloh Church. At issue was the vital rail center of Corinth, MS, only a few miles away. Although Shiloh was officially a Union victory, both sides suffered terribly. The fighting was particularly hot in the Peach Orchard and the Hornet’s Nest. Men and horses sought relief, and died, in the Bloody Pond (so-called because by battle’s end it was dyed red with blood). 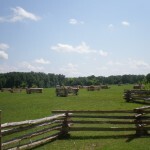 You can visit the Peach Orchard and the Hornet’s Nest and the Bloody Pond, and the rest of the vast, peaceful Shiloh battlefield park (now punctuated with memorials and helpful plaques showing troop movements during the battle). And you can bring your dog with you — leashed dogs are allowed in the park, though not in the interpretive center or bookstore, or in the national cemetery. The interpretive center has a small but informative display, and runs a film whose main interest is its ancient charm. I went in with Chloe (in her messenger bag) to view the display, then scooted back outside. The cemetery, our Uncle Stretch reported, is lovely, but we didn’t go in. The battlefield is full of historical interest for humans, and rompable grass for dogs. Take the auto tour and hop out from time to time to explore sites of particular interest on foot. Be sure to set aside several hours for the whole experience — it’s a big place, and it takes time to clear your mind and try to put yourself back into those two wretched April days.